Although I've been using AP and AD for some time now, I haven't really got to grips with absolute dimensions. I assume they are "in" there somwhere, but I haven't really found them, or how to control them. Today I wanted to share a few bathroom designs with a friend, and I knocked up a few using AD, and emailed them to him. However I had to guess the dimensions for my images. What I really wanted to do was to specify units (e.g. metres - today) and then to be able to put in absolute values for lengths in metres. What I got was OK, but it would have been better if I could have linked to units. Also some people might want to work in cm or mm, or even feet and inches. Maybe this is possible, but a search for "absolute dimensions in Affinity Designer" revealed a quite interesting video about how to use the pen and pencil tools in ways I did not know before, but did not address the dimension issue I was trying to find out about. Perhaps this information is in the Workbook(s) for AP and AD. You can also enter dimensional values in most fields using any of the unit suffix abbreviations shown in this post, regardless of the document's units. Thanks. That was helpful though I'm still finding my way with this approach. I just tried to make a very large artboard for a garden design, and I couldn't enter a figure of 100 metres for one of the dimensions. The largest number I seemed to be able to put in was just over 90. I have been assuming that everything would be scaled so very large values should be possible, without having to effectively design and think in scaled up or down units. I also find that using the drawing tools the dimensions may not be quite right by drawing/dragging - or is there a way of fixing that in the interface? I can force things to the dimensions I want by getting them approximately right, then doing fine tuning for each object, but is there a quicker way to just get some of the dimensions right first time? One other thing I wanted to do was to truncate the corner off a rectangle to model a shower tray. I did this by creating another rectangle and trying to rotate it by 45 degrees, and then overlaying the rectangles and subtracting one from the other. Almost worked, but I didn't quite get 45 degrees for the rotation angle. I know that as a multiple of 15 degrees that should be possible easily, but what if I'd wanted exactly 42.45 degrees? Is there a way of doing that without having to do a lot of fiddling about? Still, definite progress - so thanks again. A CAD propgram is probably more apopriate for this type of work than a illustration program. There's no way to set a scale in Affinity (unless you set a visual scale reference on canvas). 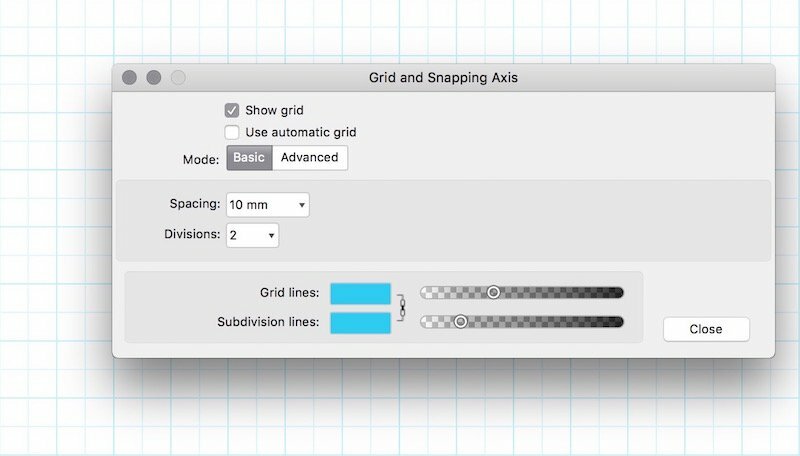 Apart from constraints for certain tools (through modifiers) the only way to set a specific dimensions for objects is entering the values in the Transform panel or use a grid as reference with snapping enabled (or enabling Snapping in general to use other objects as references when applicable). You can use the Corner Tool to quickly create 45º straight corners selecting the Corner Type in the context toolbar with the Corner Tool selected. For other angles the rotation method you are using (subtracting one rectangle from another) works perfectly as long as you use the Transform panel to set/enter the specific value you want for the rotation of one of the rectangles. Affinity will round the value for display in the rotation field but will use the value you have specified for the rotation (decimal fields included). I have not experimented with this much but I think the problem is the maximum dimensions are limited by the DPI setting -- even though vector objects can be scaled to any size, since AD & AP both support raster objects too, a max pixel dimension limit is enforced. Anyway, in Affinity Designer I had no trouble creating a new 100 X 100 meter document if I first set the DPI to 50. Maybe that will work for you as well? I can force things to the dimensions I want by getting them approximately right, then doing fine tuning for each object, but is there a quicker way to just get some of the dimensions right first time? You can probably speed this up by using Grids & Guides together with snapping, but it would depend on your workflow how well that worked. Thanks again. I wonder what the resolution is. I had suspected that DPI might interact. The assumption that users would only want to work with smallish numbers of modest units which may suit many users can fail. What about city planners who might want to deal with kilometres or miles - say 30 miles by 45 miles - with a 5 x 5 miles core? Road designers also. Obviously it could be done by "mental effort" use scaled values, but I was hoping that AD and AP could cope even with quite large units and fairly large numbers. I believe that city planners do this kind of thing, though the software they use might have auto scaling built in. I'm not sure what the limits are in Adobe Acrobat Reader, though I know some planners who use that for houses, and they use loupe tools for fine detail. Presumably they also use Acrobat or some other tools to create the planning documents. Most of us "lesser" mortals probably don't have such extreme needs. As i said city planning/design, landscape architecture, architecture etc are all fields which are better served by specialised CAD software. Unless you are creating a small garden for a house or using Affinity Designer to work/render house/garden plans for visualisation purposes, it may not be the best tool for the job. As MEB said, a CAD program is better suited to what you are trying to do. One can use AD to do simpler work. See Serif's vid on making floor plans. Last year, I needed to draw up a floor plan for a house I had inherited so I could estimate the cost of new flooring, and offer it to companies who might do the job. It was a rather ordinary plan, and I just had to make lots of rectangles using the transform dialogue to set them up to my measurements. I just set the document up as a legal size page, in inches. Don't recall the scale, but it was something like 3mm to 1". All the dimensioning and areas had to be done manually. One can download Sketch-Up for personal use, although it does a lot more than you need. It does dimensions and areas. My recollection is that there were plugins to do cost estimates for various materials. I had some years of practice w. it, and the 2-D work was quite easy to learn. I've also dabbled a bit w. Libre CAD. Somewhat harder to use than Sketch-up, which was designed for quick visualizations, as its name suggests. Libre CAD has a more technical approach. Ouch - just noticed that the heading has the "word" - "dimentions" - not the correct spelling "dimensions". If someone could fix that I'd be grateful. Maybe there's some auto correct feature which is doing this, as it just happened again! Re Sketch-up and LibreCAD - I certainly didn't know about the latter, and I probably used the former when Google called it something else. I agree that most people won't want added technical features, but today I just wanted to send some quick designs off to friend who is contemplating some new developments/extensions to his house, and while I was doing it I thought "surely I can do this more accurately ....". Some of the rounding or non rounding features of AD seemed a bit of a pain too. Is it possible to constrain it for example to mm, so that when working in metres and one is trying to get a length of 0.85 metres, one doesn't keep getting 0.8492 or 0.8523 - i.e values which are unwanted? I did discover how to get measurements accurate (or seemingly so) and OK at the resolution levels involved it really doesn't matter, but it just didn't feel right. Saying that there are other tools, or that AD wasn't really designed for this is all very well, but it can nearly do this, so why not make it work? It's a better proposition than trying to do 3D surely, which was one of my other suggestions before I realised that there's no point and tools like Blender can do that already. Obviously it could be done by "mental effort" use scaled values, but I was hoping that AD and AP could cope even with quite large units and fairly large numbers. Personally, I do almost everything in Affinity using pixels as the basic document unit, using "real" distance units only when I want to print something (which is rarely). If I am trying to do something to some specific scale, I usually can pick a scale factor that makes the mental effort required relatively trivial. It is a bit harder with U.S. English units than with metric ones, but even with them mentally working in (for example) tenths of inches helps a lot. You can change the title yourself because you started the topic: just click "Edit" at the bottom of your first post & correct the spelling. Saying that there are other tools, or that AD wasn't really designed for this is all very well, but it can nearly do this, so why not make it work? It's a better proposition than trying to do 3D surely, which was one of my other suggestions before I realised that there's no point and tools like Blender can do that already. I wasn't referring to 3D tools specifically. There's also 2D specialised CAD tools. Regarding your question - why not make it work? Improvements like these were already requested quite a few times (arrowheads, dimensioning tools etc) and may be considered/added in future versions. Feel free to create a thread in the Feature Requests section if you feel this is important for you. To address the rounding issue, here are three illustrations. 1st, establish a grid. I made one w. 10 mm division w. 2 (5 mm) divisions. Could easily have been any number to approach a level of precision needed. Then draw, noting the read-out that appears while drawing, so that you will know when you are approaching the snapping point. As I mentioned, one does need to manually annotate the document, but the drawing can be quite precise w. little effort. I used Sketch-Up from v. 2. There was no dimensioning for several more versions. The wait for the features was a good trade off, because the closest CAD package I could find at the time was about 3 times more expensive. (Google acquired it around version 7 or 8, made it free, then sold it off, and I lost my licence while that happened.) Besides the price, Sketch had nice intuitive features, and recent updates to AD have gone in the same direction by showing distances between objects while drawing, and their alignment w. other items when moved.